Back when this article was first published in 2014, the original title was “iScan VP50 Pro – Why I’m not a fan”. So what has changed? Well, it turns out that the original unit I purchased second hand from eBay was indeed faulty in some way. Having acquired another unit for testing, this new unit doesn’t exhibit nearly as many bugs as the old unit did. With that in mind, it’s time to correct this review. Regular readers of this blog will know I value my DVDO Edge, which has proven to be a flexible and reliable video processor for a number of applications. At the higher end of the market, DVDO also sold the iScan VP50 and VP50 Pro. Originally retailing for thousands, these units are once again becoming sought after and you may need to wait quite some time to find one at a reasonable price. On paper at least, the 50pro is the ultimate gamers upscaler, with support for everything from 240p up to 1080p and a blistering fast 6ms input lag time for progressive sources. Indeed, the unit is highly praised by Fudoh on his well respected video processor review page. The 50 Pro is an extremely versatile device. This versatility can lead to some quite confusing situations but the power and flexibility it grants you are second to none. The unit remembers things like v-sync lock on a per resolution basis. So for instance you could configure the processor to frame lock all 60hz content and unlock all 50hz content if you so desired. The processor will remember this and reconfigure itself accordingly each time the relevant signal is fed in. The 50 Pro’s menus are smaller than the Edge’s, making them harder to read at a distance. On the plus side, advanced options are not buried so deep. The way to configure the device is basically feed in all your different signals and configure the unit accordingly, then save this configuration to a profile. For instance on a typical TV with a 1080p/60hz source you would set the processor to output in 1080p/60hz frame locked. You then save this configuration to a profile and move on to your next source. I used Profile 1 for 60hz sources, 2 for 50hz sources and 3 for 24hz sources. If you have auto profile selection enabled, the 50 Pro will (eventually) remember which profile to use for each input and screen mode and select it accordingly. If you make a mistake while setting up the device and can’t get a picture, you will have to resort to using the menus on the little LCD panel on the front of the unit. This is fiddly, but of course preferable to having to reset the unit entirely (I’m looking at you, XRGB3). To enable “game” mode for progressive sources, that is, the mode with the least amount of input lag, you simply turn cadence detection off. This gives you access to Anchor Bay’s amazingly fast upscaling. On the VP50 Pro you can still change things like detail enhancement and edge enhancement while in this mode and of course, you still have access to the full suite of zoom/pan controls. Zoom and pan is a little fiddlier than on the Edge, as you can’t zoom both axis at the same time, so if you want an even zoom you will need to first zoom vertically then the same amount horizontally. If you’re buying a 50 Pro unit second hand, you should note that they do develop unusual faults. The first thing to try is replacing the power supply unit, as these are known to go bad. Luckily in the case of the 50 Pro this is an external unit and replacements are available on eBay. So which bugs affect this unit and which were on the faulty unit?, let’s take a look. Learning to use the profile feature is crucial to getting the most out of the unit. Disappointingly, profiles cannot be renamed. Analogue audio does not convert to HDMI – The DVDO Edge will happily take analogue audio and inject it into the HDMI picture stream, allowing you to easily stream both picture and video to a compatible receiver. My setup was wired up around this so I was disappointed to find this didn’t work on the VP50 Pro. I do not know if this was because the unit was faulty or if this fault affects all 50 pros. Update – This does seem to be very hit and miss on the replacement 50 Pro too. It works sometimes, but not always. If you’re planning on integrating one of these units then plan for routing a coax or optical audio cable too, if you want to use it with something like an OSSC. Alternatively, just route the analogue audio direct to your amplifier. Analogue inputs are inflexible – Three analogue inputs at the back of the unit seems generous at first, until you realise that the RGBHV input doesn’t support interlace, and the RGBC/Component inputs support progressive modes only from component (Ypbpr) video, and not RGBC. Slower to HDMI handshake than the Edge – The 50 Pro seems significantly slower to HDMI handshake with the display than the DVDO Edge. In practice this made it difficult to use with my gaming PC since changing resolution took so long that Windows assumed the new resolution had failed and would often switch back before I could confirm it was actually the resolution I wanted. Update – The replacement unit doesn’t seem to be affected by this at all. Doesn’t support as many screen modes – To be honest I was pretty surprised when I found out the Edge supports 1400 × 1050 (SXGA+) mode from the PC. Feed this mode into the VP50 Pro however and a blank screen is all that comes out. Update – True here on the replacement unit too, but SXGA isn’t really needed on newer graphics cards. Simply create a custom resolution of 1440×1080 and select this in your game and the GPU will convert this to 1080p with boarders. No ‘safe mode’ button – While setting up and working with the processor you will often get yourself into a situation where no picture is displayed on the screen. When this happens on the Edge, you can press the “safe mode” button which selects the most widely compatible settings, allowing you to at least see the on-screen menu again. The VP50 Pro lacks this feature. 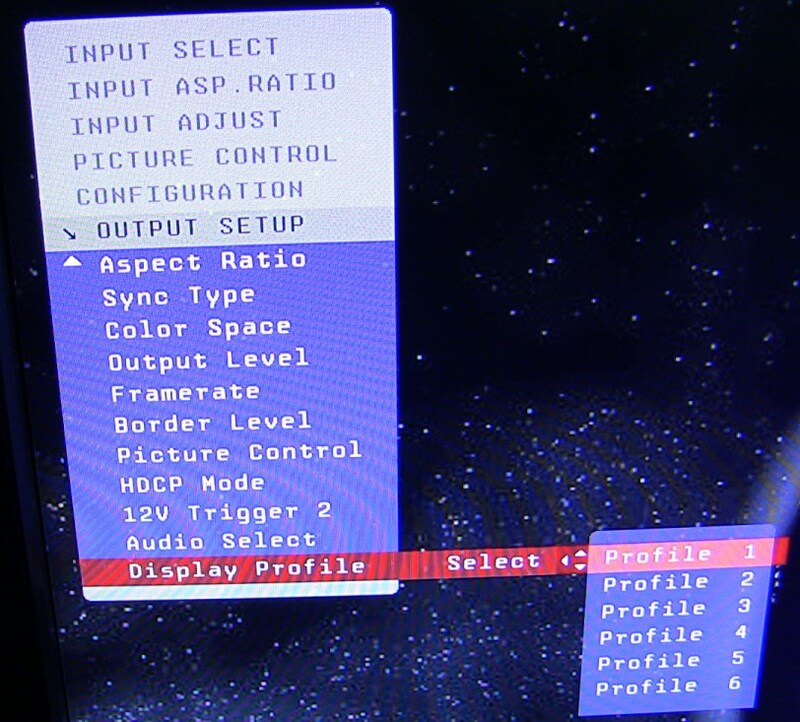 Instead, you must rely on the LCD at the front of the unit and navigate the menus there. This can quickly become frustrating. Update – Still true of course, initial configuration of the unit can be a bind, but only needs to be done once. 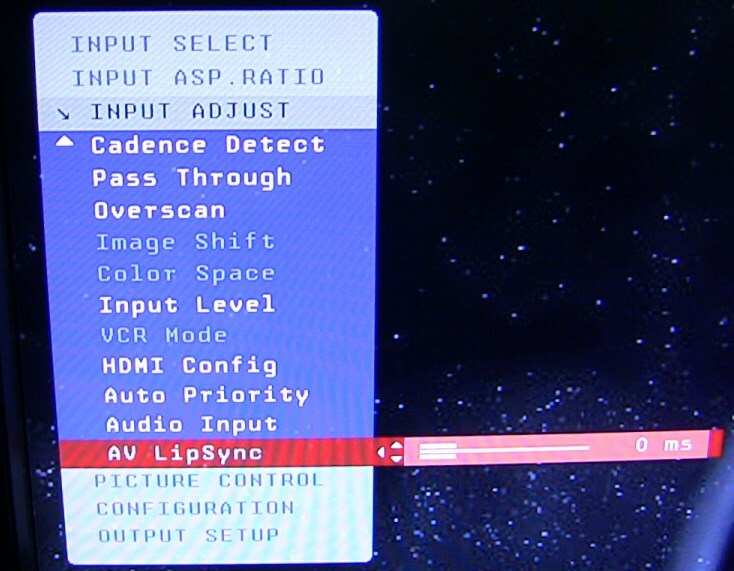 Inputs cannot be renamed – On the DVDO Edge, each input can be given a friendly name, for instance HDMI1 can be renamed “XBOX 360”. This is not possible on the VP50 Pro. This also applies to display profiles, which seems like quite an oversight. Update – Still true of course, a strange oversight. Generally less stable than the Edge – I had issues losing picture going from 60hz to 50hz on the Xbox 360 and various other times for inexplicable reasons. Again, the unit I had temporary possession of could have been faulty though there seems to be a few frustrated 50 Pro users around on the internet. Update – This was definitely due to a faulty unit as far as I can tell. If you run the output of the 50 Pro through a HDMI splitter or audio extractor or other such things, you can make it’s output less stable, but that’s just one of those things that can happen as you add more gear to the HDMI chain. If you don’t need all the extra flexibility the 50 Pro brings to the table, you might have pretty much decided by this point that the Edge is a better processor for you. Certainly the Edge is more beginner friendly. The 50 Pro’s original price tag would have probably meant that the kinds of people installing it would pay for a professional installer to run through the initial setup anyway. However, the 50 Pro has one big advantage over the DVDO Edge. We’ve talked about the amazingly fast upscaling that these processors have, but for some reason this doesn’t always apply on the DVDO Edge. Sources that have refresh rates that deviate even slightly from the 59.94 NTSC spec cause the input lag on the DVDO Edge to go from 6ms to 25ms. This does NOT happen on the 50 Pro, allowing you to play systems like Sega Saturn and PC Engine upscaled into 1080p with minimal input lag. The 50 Pro’s scaling of 240p material leaves a lot to be desired, but if you combine the unit with an OSSC, you create what is almost undoubtedly the best vintage upscaling solution for 240p games consoles and computers bar none. We’ll have more on this in a separate article. The choice of processor for your 1080p gaming setup now comes down to several factors. Budget, of course, is always a concern. Despite the high end of the AV/home theatre industry moving towards 4k, the 50 Pro continues to be somewhat sought after. Apart from gamers, many of whom will want to combine the unit with their OSSC, the 50 Pro is also sought after by home theatre enthusiasts with anamorphic projection setups. Given this, you’ll need both patience and money to snag one on eBay. You’ll also want to combine it with an OSSC as the picture quality on its native 240p scaling is pretty abysmal. Hopefully at least the OSSC will be readily available towards the end of 2016, with a few units starting to trickle onto the market over the summer. If you can live with the input lag on some systems but want a fully blown video processor for both game and movie material, the DVDO Edge is still a strong contender. If it weren’t for the input lag bug, it’d probably be our processor of choice for most setups. It’s easier to use than both the 50 Pro and the XRGB Mini. Again though, for decent 240p quality you really must combine it with a OSSC too. If you’re quite happy to run your other home theatre gear directly to your TV and don’t see the point in all this video processor hocus pocus, then for an all in one solution just for gaming the XRGB Mini is still a good choice. Its 240p and 480i processing is great, no need to add on an OSSC. Its input lag is 20ms for all sources, a little disappointing for a device designed from the ground up as as vintage gaming scaler, but not intolerable. It’s also readily available, without the need to wait and watch eBay for one to come up. A flexible processor, not without its quirks and bugs, but for the determined, this is the way to the best vintage scaling solution in the world. Thank you for posting about the bugs you encountered on the VP50. I was heavily considering this unit but have decided to go for the DVDO iScan Pro since I really only care about 240p (Sega Saturn) gaming. Seems like a far more stable solution. The fact that the VP50 doesn’t have a safe mode is a dealbreaker for me. At that price point at least. If you only care for 240p then why not an XRGB Mini? I measured it to around 20MS with Leo’s tester, so about a frame and a half. 240p PQ on the VP50 or the Edge is horrible though, you’d definitely need an OSSC or XRGB2/3 to go along with it. I see the normal VP50s go for about half the price of the VP50 Pros. Do these process 240p as well as the Pros do? Why go for the Pro? As badly as the Pro does, yes 🙂 Non pro also doesn’t support Dolby TrueHD/DTS Master amongst other things. For use with ossc only for retro games, is there any reason to get the pro over the regular vp50?